Next meeting: Wednesday: May 1, 2019. 7:30 at the Senior Center. ​You can now find us on Facebook! Announcing our speaker series continuing in April and May. Go to What's Happening for more information. Entries are now closed. Stay tuned for information about the 2019 recipients of our award. Straws, the movie was shown Thursday, January 17, to full room at the library. For all those who want to do more after seeing this presentation, please download some information about what you can do. ​Click here for this year's recipients. Sustainable Duxbury’s mission is to encourage people in town and the group’s own membership to become more sustainable by informing the community about ways to recycle, save energy, and improve the local environment. Thanks to everyone for coming to our showing of A Plastic Ocean. We had a very well attended program! Thanks to DBMS for their wonderful venue and support. Now let's all aspire to reduce the amount of plastic we use in our daily lives. The film is available on Netflix as a DVD. You can also purchase your own DVD. Go to their website, plasticocean.org, where you will find more information. There is also a lot of information about plastic pollution and what we can do. We are also sponsoring a showing of the shorter version of this film to the Duxbury schools. TOWN MEETING PASSES ARTICLE 42, to ban single use plastic bags! Article 42 was approved at town meeting. Thank you to all who came out and voted. This makes us one of over 55 towns in Massachusetts to have passed such a ban. It is a step towards living with less plastic. Sustainable Duxbury along with the Duxbury Free Library presented a Solar Panel Discussion on March 23, 2017. Here is a recap from PCN, PACTV Community News. Thanks to them for good reporting. Rep. Josh Cutler gave us a legislative update and the current incentives for Massachusetts residents. Vikram Aggarwal, Chief Executive, EnergySage: Discussed 3 Solar Options: Buying, Leasing and Community Solar. You can visit their website do your own research: www.energysage.com. Mark Lampman, Energy Consultant, Vivint Solar: Solar implications when buying or selling your home. Anna Stern, Massachusetts Clean Energy Center: Financing Options. You can also go to their website for more information about incentives and much, much more. Click here to see a clip on PACTV from last year's panel and check out our blog for a run down of last year's presentation as written in the Duxbury Clipper. The Duxbury Water Department has 12 wells (all drawing from the South Coastal Aquifer), 11 full time employees, 3 million gallons of water storage and is self funding based on water use fees. The Mass DEP recently decreased the municipal water pumping cap state wide for town water permits. All town water permits now call for a max of 65 gallons per capita, down from the previous 80 gallons per capita. Duxbury has 2 years to meet the new per capita goal. Our water department feels that the cuts are unreasonable and are concerned that Duxbury will be unable to stay under the cap during the summer months unless outside water use is severely restricted and conservation policies adopted. They plan to work on water conservation education and more policing of water use restrictions. The DEP applies the functional equivalent of “fines” on towns that do not meet the cap by forcing them to spend money on water system improvements. The cap only applies to town pumping — water pumped out of the aquifer from private wells does not count toward the DEP cap. While this year’s water level monitoring at our wells showed record lows (probably due to the drought), Peter and George believe our aquifer is in good shape. George emphasized that 80% of the water the town pumps is returned to the ground through our private septic systems. We also get a lot of rain (George says almost 60”; Mass DEP says 42-47”) and that a large portion of that water filters into the aquifer. George and Peter are not concerned about the potential impact of private water pumping on our aquifer, even for large users (e.g. North Hill Golf Course, Town sporting fields). Peter is more worried about water quality than quantity. Neither George nor Peter has been able to learn why the cap was decreased for us (except DEP’s desire to simplify permitting by having the same cap for all Mass towns) nor how the value of 65 gallons per capita was chosen. One of DEP’s rationales for lowering the cap is to aid cold water fisheries (e.g. herring runs), but Duxbury’s pumping has no impact on these. When asked how SusDux can help, Peter asked for our support at Town Meeting for funding of better filtering at some wells. For additional information, here is the report on our aquifer from Mass DEP and USGS. Our Series, Brown is the New Green, was presented in partnership with the Duxbury Free Library. Dirt: The Movie was presented March 19 at 7:00 at the Duxbury Free Library. Click here to view more information about the movie. A panel discussion was presented February 26 at 7:00 PM. Watch a presentation here by PACTV that will tell you all about this wonderful presentation. We had a great evening dishing the dirt with some great dirt professionals. We had a great showing of this amazing documentary. We had the privilege of having Dr. Sarah Das join us for a discussion following the film. DVDs of the movie are available at the library and from Sustainable Duxbury. You can contact us at sustainableduxbury@gmail.com. I'm sure a lot of people left wondering what now. 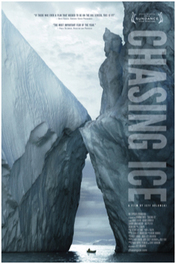 Go to the Chasing Ice website where you read more about the film. They also list some things we can all do now. Click here for that information. I have also posted this information on our blog. This movie was well attended and very informative for all. The DVD is now available for distribution through the Library's DVD collection, a gift of Sustainable Duxbury. A representative of NStar was on hand to inform all about all the energy saving programs available through NStar. Go to NStar.com for more information about Mass Save Home Energy Services, Energy Star Lighting and Products, and other cost saving programs. The Library also has available energy meters so you can track your home energy use. Every energy resource — fossil, nuclear and renewable — is undergoing profound changes. And overall, we're gradually shifting from coal and oil to the energies of tomorrow. This sweeping transition is the subject of Switch. But rather than advocate for how it should happen, Switch travels the world to discover how it most likely will happen. Sustainable Duxbury has installed four new recycling bins on Coppens Field at Chandler School. These beautiful new, bright blue bins will help to keep our fields free of bottles and plastic. They are for cans and bottles only. We encourage all to use these new bins. If you see a bottle or can, throw it in the bin. Let's help to get our bottles and cans out of the trash and into the recycling stream. 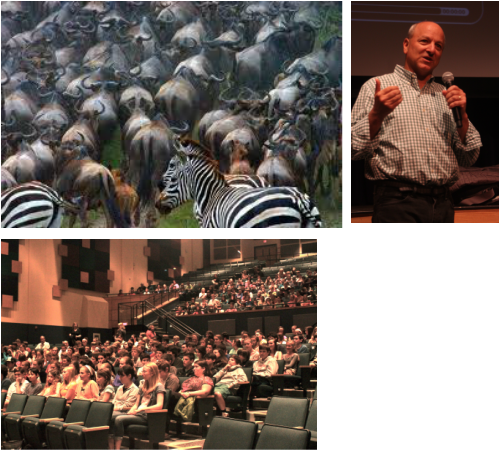 Thursday, May 9, 2013, we had a fantastic presentation by David Hamlin, National Geographic director-producer of “Great Migrations,” a stunning revelation of the extraordinary migrations of animals across the globe. The seven part series which took three years to film, spans 20 countries on all seven continents and it received two Emmy Awards. An afternoon presentation was done for the middle school students. Cheryl Lewis, Science Director for Duxbury schools, worked with Sustainable Duxbury to coordinate this presentation. In the evening, we had a program for the community. The film and the stories behind the filming, along with David's informative presentation, was mesmerizing. He took us to Africa for the wildebeest migration; to the Guadalupe Biosphere Reserve to swim with white sharks; to Mali for the elephant migration; and to Christmas Island for the breeding and migration of the red crabs. He spoke about how the changes in the environment can affect these very important balances in nature. There is a possibility of Tanzania building a road right through the Serengeti which would very much disrupt the migration of the wildebeests and zebras and affect all the animals that depend upon this migration. You can go to Stop the Serengeti Highway on Facebook to find out how you can help prevent this. He spoke about the encroaching Sahara Desert along with the changing climate and how this will affect how well the elephant do in their arduous journey. The population of red crabs of Christmas Island in the Indian Ocean, was almost depleted with the introduction of destructive ants that arrived on the island on cargo ships. This speaks to the introduction of invasive species that can harm the local, indigenous environment. Click here for a book about this series. There is also curriculum material available for educators. Click here.